Tis the season for garden fresh veggies! This recipe was inspired by the many green beans we have in our garden right now. My brother gave me a few green bean plants this year (I usually grow snap peas) so I designated one side of our (tiny) garden for them. They took off like wild fire! In addition to green beans we have tomatoes and zucchini producing right now so I’ve been playing with recipes combining all 3 veggies. I discovered a favorite stir fry! The thing that sealed the deal for this combo was TAHINI! I found that adding tahini gives a creamy texture that completes this blend! 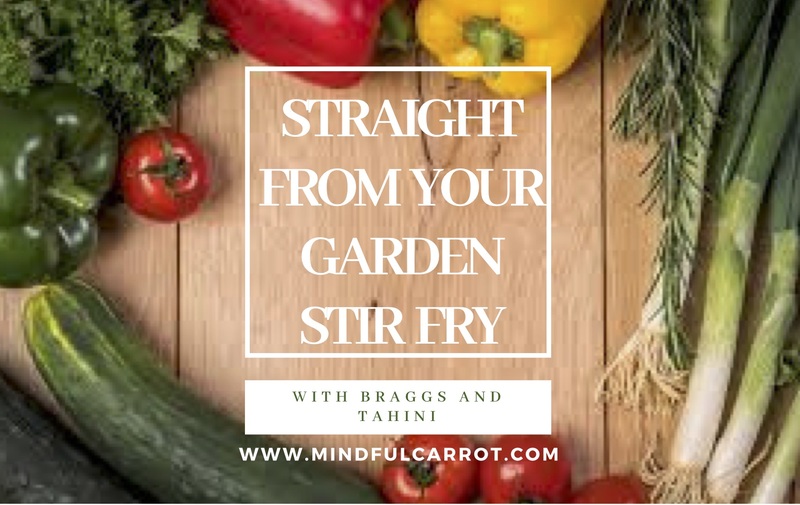 You can add any veggies to this recipe and play around with how much Braggs you add- it’s similar to soy sauce but much lower sodium and contains all the essential amino acids. SO GOOD YOUR KIDS WILL EAT IT AND ITS STRAIGHT FROM THE GARDEN!